With advances in technical progress, the impact of human activities on the environment is becoming more and more devastating. Nowadays, people are suffering from negative effects of various physical and chemical factors. One of the most serious problems of modern manufacturing companies is poor air quality inside the industrial premises. Specialists have discovered more than a thousand of toxic substances so far, which may negatively affect the state of health of workmen and cause dangerous diseases. Thereupon, the issue of ensuring industrial and ecological safety of manufacturing companies has become very acute. The paper considers the way of designing a model ventilation system for industrial premises using Simulink simulation environment in Matlab complex. The model experiment and the estimation of dynamic indicators are under way. Keywords: model experiment, ventilation system, system model. Ananev V.A., Balueva L.N., Galperin A.D. Ventilation and conditioning systems. Theory and Practice. – Moscow: Evroklimat, 2001. 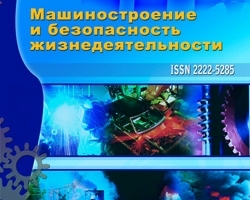 – 416 p.
Antimonov S.V., Solovyh S.Y., Vasilevska S.P. Types of ventilation and method of calculation of ventilation in rooms: Guidelines on the course ventilation systems – Orenburg: OSU, 2003. – 21 p.
Peregoudov V.F., Tarasenko V.P. Introduction to systems analysis. – Moscow: Nauka, 1989. Sovetov B.Y, Yakovlev S.A. Modeling of systems. – Moscow: Higher School, 2001. – 343 p.
Sereda S.N. The model parameters estimation of the environmental safety systems // Engineering industry and life safety, 2011, № 1. – P. 10-13. Belov P.G. Modeling of dangerous processes in the technosphere. – Moscow: Publishing House of the Academy of Civil Defence Emergency Situations Ministry, 1999. – 124 p.
Teriokhin V.V. Modeling in MATLAB system: Study Guide – Novokuznetsk: Kuzbassvuzizdat, 2004. – 376 p.
Semchenok M.S., Semchenok N.M. The Matlab system. Part 1: Textbook. – St. Petersburg: Pub. SPbGUKIT, 2004. – 140 p.